A major article by Hailey Heinz appeared in the Albuquerque Journal on Tuesday, July 31st, on page C-1 (Metro & NM), with the title " Group: Grading System Too Complex." 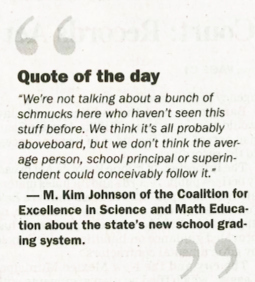 Also, a sound bite by our own Kim Johnson was selected by the Journal as Tuesday's "Quote of the Day." The copyrighted article goes into detail on CESE's findings regarding the A-F grading system, and on its interactions with the state legislature. A nonpartisan group of scientists and mathematicians says the state’s new A-F school grading system is too complex for most people to understand, including principals and superintendents. The group also believes the system adds elements together that aren’t compatible, and that the formula’s sensitivity to small changes results in unreasonable grade changes from one year to the next. M. Kim Johnson, past president and an author of the report, said Rep. Rick Miera, D-Albuquerque, asked the group to examine the A-F school grading system and try to replicate it. Johnson said the group has testified before the Legislative Education Study Committee in the past and did so recently to present its findings. Those findings were cited by Democrats in the Legislature, who sent out a news release last week expressing “deep concern” over the credibility of the A-F grades. Those quoted in the news release included Sen. Linda Lopez, D-Albuquerque; Sen. Howie Morales, D-Silver City; and Miera. ... Doing so also is part of the reason for dramatic changes in grades. Those changes have come under scrutiny, as some school grades went from “B” to “F,” and vice versa, between preliminary January grades and final July grades. The full article in appears in the Wednesday Journal. The Coalition for Excellence in Science and Math Education (CESE) was mentioned prominently in a July 26th article in the Capitol Report New Mexico. Roundhouse Democrats and officials in the Susana Martinez administration are exchanging verbal shots over the governor’s school reforms — and a little-known educational group cited by the Democrats didn’t even know it was even being prominently mentioned in the debate. 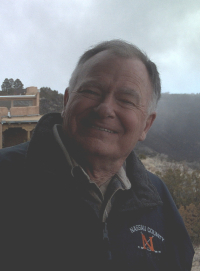 On Thursday afternoon, Capitol Report New Mexico called R. [M.] Kim Johnson, who is a past president and board member of the Coalition for Excellence in Science and Math Education (CESE) who said he had not heard that his organization was cited in the Roundhouse Democrats’ news release until he was told by this reporter. “We were not aware they were going to say that,” Johnson said, although he added that “I’m not unpleased” to hear the news. A retired physicist, Johnson says educational reform is “more complex than simply adopting a method” and said he had talked to Rep. Miera at a recent Legislative Education Study Commitee meeting. CESE is a 501(c)3 non-profit organization that is non-partisan, and does not advocate for any specific political party. All we care about is having New Mexico schools perform to their potential. That has always been our dream. You may read the NM Democrats Press Release here. CESE was invited to perform an analysis by the request of the LESC, and the information generated for this work is in the public domain. Contact CESE if you would like more information. Cheers to the board and our membership for a great annual meeting. Thanks to Terry for a great year as president. Thanks to Matt for serving as our Vice President. Thanks to Jerry for serving so long and so effectively as our treasurer. Thanks to Marilyn for her expertise and dedication as our secretary. Thanks to our At Large Board Members: Rebecca, Marshall, Steve, Cindy, Lisa, Jack, Jesse, Kim, Marvin and Dave. Thanks to Pauline Eisenstadt for her insider's explanation of the inner workings of that often beneficial, often malevolent organism we know as our state legislature. It's a sad commentary on our history that being the first woman to serve in both houses of the legislature is a noteworthy achievement, but I know we're glad it was Pauline. Thanks to Pauline for all the good work she did to make New Mexico a better place to live and especially for taking the lead in the Evolution Wars. I read part of the Evolution Chapter relating the history of the battle for Science in our public schools and recommend to book to everyone. Thanks to "The Amazing Dave" who held our rapt attention with a magic trick so stunning he didn't need a shapely female assistant. Dave also obtained our new domain name cese.org and arranged for the room, with the help of sponsor Les McFadden of UNM Geology Department. Thanks to those who had the foresight to create and sustain this organization. Thanks to all our loyal and supportive members. Nothing would happen without you. Thanks to you for entrusting me to lead CESE as your president. I know I can count on you all for guidance and support. Continue the Murfin work. This is our most important contribution to teaching and learning in New Mexico. No one else is setting aside hunches, solutions that feel good, or solutions based on anecdotal information, in favor of cold-blooded research, statistical analysis and fearless presentation of the facts. At this moment, "Think New Mexico" is pushing their "Smaller Schools Initiative," claiming they have research showing, "smaller schools have better graduation rates and stronger school achievement, particularly for the most vulnerable students." Walt Murfin's method proves otherwise. Meanwhile The Santa Fe School District is already moving in that direction. No other organization is able to separate those factors which affect student performance but are outside the control of school staff, from areas that are. No other organization can tell when a school is outperforming or underperforming what is expected of it based on demographics. This is not to make excuses for poor performance. It is to show the role society plays in student achievement and the limitations of our schools. Others, including PED, have made attempts but the Murfin analysis has proven they fall short. Expand the audience for the Murfin work. Presentations have been given in several forums. Who else needs to hear what has been developed? How can they be reached with limited funds and time? Clarify CESE’s roll in educational improvement as strictly non-partisan and neither pro-union nor anti-union. Both political parties are wrong in their approach to student achievement. Solutions based on political ideology have failed. Continue supporting public policies that result in better Science teaching and encourage members to take part in the political process. Rather than only reacting to anti-Science proposals, CESE will advocate for legitimate, peer-reviewed Science. Creationists will have to explain why they want to redefine Science to fit their theology. Instead of just opposing bad legislation, we can also support good legislation. Recruit new members. CESE is unique among organizations working to improve teaching and learning. CESE invites and welcomes teachers into their ranks and respects the complexities of teaching. CESE actually listens to teachers. One group missing from our membership is principals, assistant principals and other school leaders. It’s easy for teachers to demean administrators (I’m good at that), but, it’s important to recruit them, include them, respect the complexities of administration and learn from them.